This newly released Hubble image shows spiral galaxy RX J1140.1+0307, which is located one billion light-years away. 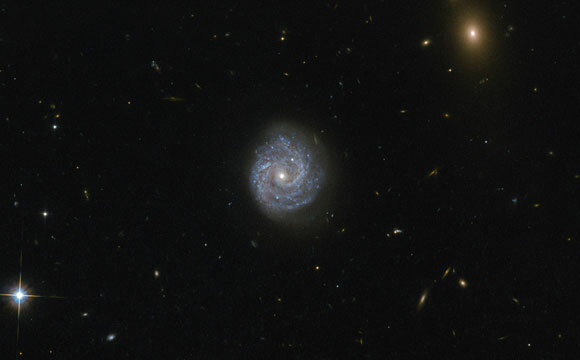 This image taken with the Advanced Camera for Surveys (ACS) onboard the NASA/ESA Hubble Space Telescope captures a galaxy in the Virgo constellation. This camera was installed in 2002, and its wide field of view is double that of its predecessor, capturing superb images with sharp image quality and enhanced sensitivity that can be seen here. The beautiful spiral galaxy visible in the center of the image is known as RX J1140.1+0307, and it presents an interesting puzzle. At first glance, this galaxy appears to be a normal spiral galaxy, much like the Milky Way, but first appearances can be deceptive! The Milky Way galaxy, like most large galaxies, has a supermassive black hole at its center, but some galaxies are centered on lighter, intermediate-mass black holes. RX J1140.1+0307 is such a galaxy — in fact, it is centered on one of the lowest black hole masses known in any luminous galactic core. What puzzles scientists about this particular galaxy is that the calculations don’t add up. With such a relatively low mass for the central black hole, models for the emission from the object cannot explain the observed spectrum; unless there are other mechanisms at play in the interactions between the inner and outer parts of the accretion disc surrounding the black hole. Be the first to comment on "Hubble Views a Black Hole of Puzzling Lightness"